The museum's origins can be traced back to the founding of the Denver Artists Club in 1893. The Club renamed itself the Denver Art Association in 1917 and opened its first galleries in the City and County building two years later. The museum opened galleries in the Chappell House in 1922. The house, located on Logan Street, was donated to the museum by Mrs. George Cranmer and Delos Chappell. In 1923, the Denver Art Association became the Denver Art Museum (DAM). In 1948, the DAM purchased a building on Acoma and 14th Avenue on the south side of Civic Center Park. Denver architect Burnham Hoyt renovated the building, which opened as the Schleier Memorial Gallery in 1949. While the Schleier Gallery was a significant addition, the DAM still sought to increase its space. Additional pressure came from the Kress Foundation, who offered to donate three collections valued at over $2 million on the condition that DAM construct a new building to house the works. 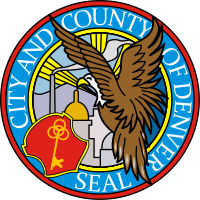 DAM sought help from the city and county of Denver to raise funds, however, in 1952 voters failed to approve a resolution bond. Despite this setback, the museum continued to raise funds and eventually opened a new building, the South Wing (now known as the Bach Wing), in 1954. This made it possible for DAM to receive the three Kress Foundation collections. The North Building, a seven-story 210,000-square-foot addition, opened in 1971, allowing the museum to finally display its collections under one roof. 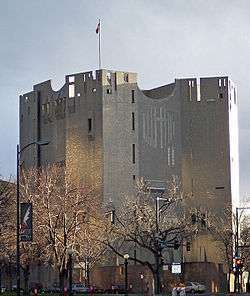 The building was designed by Italian modernist architect Gio Ponti, with local architects James Sudler Associates of Denver. Ponti said, “Art is a treasure, and these thin but jealous walls defend it.” It is his only completed design built in the United States. Ponti wanted the DAM building, housing the important art within, to break from the traditional museum archetypes. The two-towered "castle-like" façade has 24 sides, and more than one million reflective glass tiles, designed by Dow Corning, cover the building’s exterior. The Duncan Pavilion and the Frederic C. Hamilton Building were both added to the museum in 2006. The Duncan Pavilion, a 5,700-square-foot second story addition to the Bach Wing, came to receive the bridge traffic from the new Hamilton Building and the existing North Building (1971). Duncan Pavilion was designed to be kid- and family-friendly while also suitable for multi-use (e.g., during the museum’s Untitled Final Friday series as well as wedding receptions and other events). It was intended to complement both buildings. The Hamilton Building was designed as a joint venture by Studio Daniel Libeskind and Denver firm Davis Partnership Architects (architect of record). The new building opened on October 7, 2006, and is clad in titanium and glass. The project was recognized by the American Institute of Architects as a successful Building Information Modeling project. The Duncan Pavilion is a second story addition to the Bach Wing of the Denver Art Museum and opened in February 2006. It is a link between the Daniel Libeskind-designed Hamilton Building and the 1971 Geo Ponti-designed North Building. The project's intent included preserving the integrity of the oldest part of the museum, the Bach Wing built in 1954, while providing a significant mechanical upgrade for it. The Duncan Pavilion's open assembly area receives the pedestrian bridge from the Hamilton Building with a pedestrian elevator and glass staircase linking pedestrian traffic to the Signature Gallery on the first floor. An upgraded extension of the existing freight elevator creates the final link in the system facilitating artwork traffic between the existing and new buildings so the artwork can be received and serviced in the Hamilton Building and transported to and from the Ponti building’s galleries without exiting the protective environment of the museum. The Frederic C. Hamilton Building — under construction. Architect Daniel Libeskind, architect of the Frederic C. Hamilton Building. The Frederic C. Hamilton Building, celebrating its 10th anniversary in 2016, holds the Modern and Contemporary art, African art and Oceanic art collections, along with part of the Western American art collection and special exhibition spaces. The building also serves as the main entrance to the rest of the museum complex. This project doubled the size of the museum, allowing for an expansion of the art on view. The complex deconstructivist geometric design of the Hamilton building consists 20 sloping planes, covered in 230,000 square feet of titanium panels. The angular design juts in many directions, supported by a 2,740-ton structure that contains more than 3,100 pieces of steel. One of the angled elements extends 167 feet over and 100 feet above the street below. None of the 20 planes is parallel or perpendicular to another. Libeskind designed a landscaped pedestrian plaza for the DAM complex, which also displays significant works of outdoor sculpture. The works include: 'Scottish Angus Cow and Calf' by Dan Ostermiller, 'Big Sweep' by Coosje van Bruggen and Claes Oldenburg, and 'Denver Monoliths' by Beverly Pepper. The design of the Hamilton extension of DAM has received mixed reviews. Christopher Hawthorne, architecture critic for the "Los Angeles Times," said the architectural achievement of the building does not mean it works well as a museum. He called the Hamilton Building "a stunning piece of architectural sculpture," but "a pretty terrible place for showing and looking at art." "Museum architecture does not always blend cohesively with a great architectural achievement." Some visitors and Denver residents appreciate the design, such as the Andreesons, who said, “We’re in normal looking buildings every single day. It’s just kind of an experience to walk into a room that doesn’t look like rooms that we would normally be in.” Sharp said that was exactly what the museum was looking for in their expansion. He said the museum’s board was seeking the opportunity to draw people to the city. The museum has nine curatorial departments: Architecture, Design and Graphics; Asian Art; Modern and Contemporary; Native Arts (African, American Indian and Oceanic); New World (pre-Columbian and Spanish Colonial); Painting and Sculpture (European and American); Photography; Western Art; and Textile Art and Fashion. The Denver Art Museum’s Architecture, Design and Graphics department was founded in 1990 by former director Lewis I. Sharp. The collection has developed concentrations in areas including Italian design from the 1960s and 1970s, American graphic design from the 1950s to the present day, post-World War II furniture and product design in America and western Europe and contemporary western European and Japanese design. Today, the collection consists of more than 12,000 objects dating from the sixteenth century to the present. The collection also includes the AIGA Design Archives. The museum's Asian art collection includes galleries devoted to the arts of India, China, Japan and Southwestern Asia, as well as works from Tibet, Nepal and Southeast Asia. The collection, which originated in 1915 with a donation of Chinese and Japanese art objects, spans a period from the fourth millennium B.C. to the present. The DAM's Modern and Contemporary Art collection encompasses over 12,500 works made since 1900 and includes works by artists including Pablo Picasso, Marcel Duchamp, Henri Matisse and Georgia O'Keeffe, as well as 33 paintings, drawings and collages by the acclaimed abstract expressionist Robert Motherwell. The collection also holds representative works from the major post-war art movements, including abstract expressionism, minimalism, pop art, conceptual art and contemporary realism. The department includes the Herbert Bayer Collection and Archive, containing more than 8000 objects. A visitor favorite, Linda, by Denver artist John DeAndrea, is a life-size realistic sculpture of a sleeping woman. Made of polyvinyl, the piece is sunlight-sensitive and is shown only for short periods of time. In 1983 the museum became the home of the controversial pop-art sculpture The Shootout by Red Grooms. It represents a cowboy and an Indian shooting at one another. The sculpture, now on the roof of the museum restaurant, had been evicted from two other downtown Denver locations after Native American activists protested and threatened to deface the work. The DAM’s Native Arts department includes the arts of the indigenous peoples of Africa, North America and Oceania. In the African, American Indian and Oceanic art collections, modern and contemporary artists are also represented, reflecting the continued but evolving artistic practice of indigenous artists and cultures. The African art collection consists of approximately 1000 objects, and focuses on the diverse artistic traditions of Africa, including rare works in sculpture, textiles, jewelry, painting, printmaking and drawings. Works from all regions—with a focus on West African art, emphasizing Yoruba works—and mediums, including wood, metals, fibers, terracotta and mixed media compositions, are represented in the collection. The museum's American Indian art collection represents works of nearly every tribe across North America. Beginning in the 1920s, the DAM was one of the first museums to use aesthetic quality as the criteria to develop a collection of Native American art, and the first fine arts museum in the country to collect American Indian art. The collection contains nearly 20,000 art objects, including ancient puebloan ceramics, 19th-century Arapaho beaded garments and contemporary glasswork. Works by contemporary artists such as Jeffrey Gibson, Roxanne Swentzell and Dan Namingha are included in the collection. The Oceanic art collection includes more than 1000 pieces representing art forms from all major island groups in the South Pacific region and the geographic regions of Melanesia and Polynesia. Historic monumental sculpture, bark cloth, wood carvings and the work of contemporary artists such as Mathias Kauage and Laben Sakale are features of the collection. The New World department, established in 1968, brings together pre-Columbian (before 1492) and Spanish Colonial objects from Latin America. The combined collections cover a time span from about 1200 B.C. to present day. The department represents one of the most comprehensive collections of such work outside the countries of origin and features major stylistic movements from all the major artistic centers of Latin America. The Jan and Frederick Mayer Galleries of Pre-Columbian and Spanish Colonial Art were first installed in 1993. Included are pre-Columbian works in ceramic, stone, gold, jade and textiles. From the Spanish Colonial Period, the collection includes paintings, sculpture, furniture, silver and decorative arts. The galleries include a study-storage gallery (the Lila Wallace-Reader's Digest Study Gallery of Pre-Columbian Art) where nearly all of the DAM's pre-Columbian collection is displayed. The Frederick & Jan Mayer Center at the Denver Art Museum aims to increase awareness and promote scholarship in the fields of pre-Columbian and Spanish Colonial art through the DAM's New World Collections. The Mayer Center sponsors annual symposia and publication of their proceedings, research opportunities including a resident fellowship program and periodic study tours to Latin America and Spain. The programming of the Mayer Center is directed by the DAM's New World Department. The DAM's Pre-Columbian art collection represents nearly every major culture in Mesoamerica, Central America and South America. The glass-shelved display cases in the study-storage gallery allow scholars to view nearly all of the museum's collection. The encyclopedic Costa Rican holdings, largely donated by Frederick and Jan Mayer, include stone sculptures, jade works and ceramics; Mesoamerican art from Mexico and northern Central America includes rare media like carved shell, turquoise mosaic and obsidian; and the Maya civilization is represented by stone relief carvings and rare pre-Classic ceramic vessels and figurines, Early Classic cache vessels and blackware containers and Late Classic painted cylinders and figurines. The Spanish Colonial collection of paintings, sculpture and furniture spans three and a half centuries (c. 1492–1850) and comprises more than 3000 objects representing the cultures and geographic areas of Latin America including Mexico, Guatemala, Panama, Colombia, Venezuela, Ecuador, Bolivia, Peru, Argentina, Chile and the southwestern United States. The collection includes objects such as Aztec-style feather paintings, small copper paintings worn as brooches by nuns and panel paintings inlaid with mother-of-pearl. The major stylistic movements and workshops of the Spanish Colonial period are represented in pieces such as the Virgin of Málaga by Bolivian artist Luis Niño, Madonna and Child with Bird by Peruvian Ignacio Chacón and Saint Michael and the Bull by Mexican artist Sebastián López de Arteaga. Gifts of Mexican Colonial paintings and decorative arts from the Mayer family; Peruvian and Bolivian objects from the Frank Barrows Freyer Memorial Collection; a collection of Spanish Colonial silver from the Robert Appleman family; and holdings from Anne Evans, as well as the Stapleton Foundation of Latin American Colonial Art and Stapleton collections have expanded the depth and breadth of the Spanish Colonial collection. The Painting and Sculpture department oversees a collection of more than 3000 European and American paintings, sculptures and prints. The European collection represents works created before 1900, and the American collection represents all major periods in American art before 1945. The department also curates the Berger Collection of mostly British paintings, drawings and medieval works of art, and a collection of predominantly French 18th- and 19th-century drawings on long-term loan by a private collector. Artists represented include Claude Monet (Waterlilies), Camille Pissarro (Autumn, Poplars, Éragny), Winslow Homer (Two Figures by the Sea), Gustave Courbet (Valley of the Black Pool), Lucien Lévy-Dhurmer (The Dolomites), Edgar Degas (Examen de Danse), Giovanni Benedetto Castiglione (Deucalion and Pyrrha), Giuseppe Arcimboldo (Summer) and Thomas Cole (Dream of Arcadia). The Berger Collection is a major private collection largely of British art that includes approximately 200 works and spans more than six centuries. Renaissance portraits, including works by Hans Holbein the Younger, are a strength of the collection. Other artists represented include Nicholas Hilliard, Thomas Gainsborough, Angelica Kauffman, Benjamin West, Edward Lear and David Hockney. Frederic C. Hamilton bequeathed 22 Impressionist works from his private collection to the museum in 2014, including Vincent van Gogh's Edge of a Wheat Field With Poppies, fours works by Claude Monet, three paintings by Eugène Boudin and works by Paul Cézanne, Edouard Manet, Berthe Morisot, Camille Pissarro, Auguste Renoir, Alfred Sisley, William Merritt Chase and Childe Hassam. The DAM established a dedicated curatorial department to photography in 2008. The department's collection includes numerous 19th-century works, notably of the American West, as well as holdings of European and American modernist photography. Works by early Western photographers William Bell and Timothy O'Sullivan, 19th-century artists William Henry Fox Talbot and Henry Bosse and modernist photographers such as Gyorgi Kepes and Man Ray are included in the collection. The DAM's Textile Art and Fashion department features a collection of over 5000 objects from around the world that range from archeological textiles to contemporary works of art in fiber. An internationally recognized collection of more than 300 American quilts are included in the department's holdings, as well as the Julia Wolf Glasser collection of 18th- and 19th-century samplers, the Charlotte Hill Grant Collection of Chinese textiles and ecclesiastical vestments and textiles from the Renaissance to the 1900s. Fashion was added to the department title in 2015, representing an additional collecting area for the museum. Attached to the textile art gallery, the Thread Studio serves as a space for visitors to participate in interactive textile art activities. The Petrie Institute of Western American Art at the Denver Art Museum is a leader in scholarly research and programming in the field of art of the American West. The DAM has collected and exhibited western American art since the 1950s. In 2001, the museum received a gift of western paintings and bronzes, allowing it to establish the institute of western American art. The institute is organized to support the study, collection, preservation and exhibition of art created about the American West, its people, its history and its landscape. In the Enemy's Country by Charles M. Russell, The Cheyenne by Frederic Remington and Long Jakes, "The Rocky Mountain Man" by Charles Deas are the anchors for the museum's collection. Other highlights include Thomas Moran's Mount of the Holy Cross, Albert Bierstadt's Wind River Country and E. Martin Hennings' Rabbit Hunt. In 2001, the Western American Art collection was augmented by a gift of more than 700 art objects from the Bill and Dorothy Harmsen Family; this was the impetus for establishing the institute of western American art at the DAM. The institute received its new title—the Petrie Institute of Western American Art—in 2007, following a gift from the Thomas A. Petrie family to partially endow the department. In 2013, the museum received a gift of American art from Henry Roath that doubled the importance of its existing western collection. The Roath Collection comprises more than 50 works, ranging in date from 1877 to 1972, by artists such as Albert Bierstadt, Thomas Moran, Frederic Remington and Ernest L. Blumenschein. 2001 "European Masterpieces: Six Centuries of Paintings from the National Gallery of Victoria, Australia"
2002 "The Cos Cob Art Colony: Impressionists on the Connecticut Shore"
2002 "Metamorphosis: Modernist Photographs by Herbert Bayer and Man Ray"
2002 "Art & Home: Dutch Interiors in the Age of Rembrandt"
2003 "Antarctica: Through the Eyes of Those Who Live It"
2003 "RETROSPECTACLE: 25 Years of Collecting Modern and Contemporary Art"
2004 "Frederic Remington: The Color of Night"
2004 "Painting a New World: Mexican Art and Life, 1521-1821"
2004 "Tiwanaku: Ancestors of the Inca"
2005 "Heaven and Home: Chinese Art of the Han Dynasty from the Sze Hong Collection"
2005 "Amish Quilts: Kaleidoscope of Color from the Collection of Faith and Stephen Brown"
2005 "Blanket Statements, an exhibition of Navajo Weavers"
2006 "RADAR: Selections from the Colorado Collection of Vicki and Kent Logan"
2006 "Breaking the Mold: The Virginia Vogel Mattern Collection of Contemporary Native American Art"
2006 "Japanese Art From the Collection of John and Kimiko Powers"
2007 "Artisans & Kings: Selected Treasures from the Louvre"
2007 "George Carlson: Heart of the West"
2007 "Clyfford Still Unveiled: Selections from the Estate"
2008 "Landscapes from the Age of Impressionism & Inspiring Impressionism"
2010 "Olivetti: Innovation & Identity"
2011 "Robert Adams: The Place We Live, A Retrospective Selection of Photographs"
2011 "Xu Beihong: Pioneer of Modern Chinese Painting"
2011 "Cities of Splendor: A Journey through Renaissance Italy"
2012 "Yves Saint Laurent: The Retrospective"
2012 "El Anatsui: When I Last Wrote To You about Africa"
2012 "Dana Schutz: If the Face Had Wheels"
2012 "Ed Ruscha: On the Road"
2013 "Georgia O'Keeffe in New Mexico: Architecture, Katsinam, and the Land"
2013 "Mud to Masterpiece: Mexican Colonial Ceramics"
2013 "Figure to Field: Mark Rothko in the 1940s"
2014 "Modern Masters: 20th Century Icons from the Albright-Knox Art Gallery"
2014 "The American West in Bronze, 1850-1925"
2014 "Beyond Pop Art: A Tom Wesselmann Retrospective"
2014 "Matisse and Friends: Selected Masterworks from the National Gallery of Art"
2014 "Brilliant: Cartier in the 20th Century"
2015 "Joan Miró: Instinct & Imagination"
2015 "Revolt 1680–2180: Virgil Ortiz"
2015 "Showing Off: Recent Modern and Contemporary Acquisitions"
2015 "In Bloom: Painting Flowers in the Age of Impressionism"
2016 "Super Indian: Fritz Scholder, 1967–1980"
2016 "Wyeth: Andrew & Jamie in the Studio"
The museum’s Learning & Engagement department has emphasized three areas: 1) Research in making museum visits successful and enjoyable; 2) Creation of innovative installed learning materials (e.g., audio tours, labeling, video and reading areas, response journals and hands-on and artmaking areas); and 3) Interactive learning for young people both in school and family groups. Family-friendly programs and activities include the Just for Fun Family Center, gallery games, the Discovery Library, Kids Corner and Family Backpacks. Access programs at the DAM include Art & About tours, for visitors with early-stage Alzheimer's or dementia; Low Sensory Mornings; and Tactile Tables. The museum is run by a non-profit organization separate from the City of Denver. 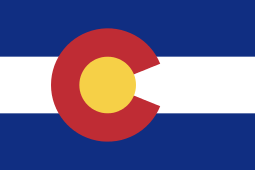 Major funding for the museum is provided by a 0.1% sales tax levied in the Scientific and Cultural Facilities District (SCFD), which includes seven Colorado counties (Adams, Arapahoe, Boulder, Broomfield, Denver, Douglas and Jefferson) in the Denver-Aurora metropolitan area. The district provides funding to about 300 arts, cultural and scientific organizations in the seven counties. About 65% of this tax is used to provide funding for the Denver Art Museum and four other major science and cultural facilities in Denver: the Denver Botanic Gardens, the Denver Zoo, the Denver Museum of Nature and Science and the Denver Center for the Performing Arts. In addition, the museum receives large private donations and loans from private collections. Over the past five years, the Denver Art Museum has averaged more than 600,000 visitors a year. 1 2 "Mission & History: History". denverartmuseum.org. Retrieved May 23, 2016. 1 2 3 4 Harris, Neil. "Searching for Form: The Denver Art Museum in Context." The First Hundred Years, Denver Art Museum, 1996. 21-53. Print. ↑ Story, Lewis Wingfield. "Building a Collection." The First Hundred Years, Denver Art Museum, 1996. 75-135. Print. 1 2 3 4 "Mission & History: The Buildings". denverartmuseum.org. Retrieved May 23, 2016. ↑ "Denver Art Museum". gioponti.com. Retrieved May 24, 2016. ↑ "Denver Art Museum – Frederic C. Hamilton Building". Davis Partnership Architects. Retrieved May 23, 2016. ↑ "Visitor Info: Gallery Map". denverartmuseum.org. May 23, 2016. ↑ Saieh, Nico. "Denver Art Museum/Daniel Libeskind." Arch Daily. N.p., October 5, 2010. Web. March 29, 2012. 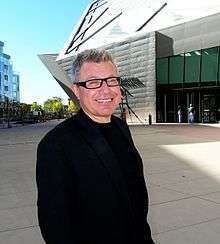 <http://www.archdaily.com/80309/denver-art-museum-daniel-libeskind/>. ↑ Structure Magazine (November 2007). "Spotlight: Denver Art Museum" (PDF). ↑ "Frederic C. Hamilton Building". arcspace.com. Retrieved May 24, 2016. ↑ Studio Libeskind. "Extension to the Denver Art Museum, Frederic C. Hamilton Building". ↑ denverartmuseum.org. "Outdoor Art Around the Denver Art Museum" (PDF). 1 2 American Institute of Steel Construction. "2007 IDEAS2 Awards." Modern Steel Construction 2007. Print. 1 2 3 Sydell, Laura, perf. "Blancing Form, Function In Museum Architecture." All Things Considered. NPR: December 8, 2008. Radio. ↑ "Contact Us | Denver Art Museum". denverartmuseum.org. Retrieved June 28, 2016. ↑ "'Linda' Sculpture At Denver Art Museum Is So Life-Like People Think She's Breathing," CBS4, April 19, 2015. ↑ Irene Clurman, "Orphan sculpture to find home at art museum," Rocky Mountain News, October 12, 1983, p.6. ↑ Iver Peterson, "Pop Sculpture in Denver," The New York Times, October 6, 1983. ↑ "American Indian Art". Retrieved June 28, 2016. ↑ "Logan Collection | Denver Art Museum". denverartmuseum.org. Retrieved June 28, 2016. ↑ "Frederick & Jan Mayer Center for Pre-Columbian & Spanish Colonial Art". mayercenter.denverartmuseum.org. Retrieved June 28, 2016. ↑ "Berger Collection (BCET) | Home". www.bergercollection.org. Retrieved June 29, 2016. ↑ Randy Kennedy, "Denver Art Museum Gets Impressionist Trove," The New York Times, January 12, 2014. ↑ "Frederic C. Hamilton Donates Impressionist Masterworks to the Collection of the Denver Art Museum | Denver Art Museum". denverartmuseum.org. Retrieved June 29, 2016. ↑ Michelle Tay, "Denver Art Museum Taps Florence Muller as Curator of Textile Art and Fashion," BlouinArtinfo, August 10, 2015. ↑ "Denver Art Museum's Petrie Institute of Western American Art reaches endowment goal | Denver Art Museum". denverartmuseum.org. Retrieved June 29, 2016. ↑ Miller, R Craig; Haag Bletter, Rosemarie; Denver Art Museum (2001). "US design 1975-2000". Munich ; New York: Prestel: 255 pages : illustrations (chiefly color) ; 31 cm. OCLC 49683001Published in conjunction with the exhibition of the same name organized by the Denver Art Museum. Exhibition tour: Denver Art Museum, Denver, Colorado, Feb.-May 2002; Bass Museum of Art, Miami, Florida, Feb.-May 2003; American Craft Museum, New York, New York, June-Oct. 2003; Memphis Brooks Museum of Art, Memphis, Tennessee, Nov. 2003-Feb. 2004. ↑ "Kids & Families | Denver Art Museum". denverartmuseum.org. Retrieved June 29, 2016. ↑ "Access Programs | Denver Art Museum". denverartmuseum.org. Retrieved June 29, 2016. ↑ "Museum Education Internships | Denver Art Museum". denverartmuseum.org. Retrieved June 29, 2016. ↑ "Scientific and Cultural Facilities District". scfd.org. Retrieved June 29, 2016. ↑ "SCFD Support | Denver Art Museum". denverartmuseum.org. Retrieved June 29, 2016. Wikimedia Commons has media related to Denver Art Museum. Wall Street Journal: The Mastery Behind Denver's "Becoming van Gogh" exhibition.